Entrance to windsurf pages with lots of windsurf stuff and problems. 1. Fra Dragsmur, sept. '06. 2. Fra Dragsmur, sept. '07. 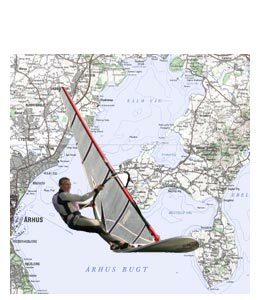 På windsurfing-togt på Århus Bugten. skrift - og få en røverhistorie. On Neil Pryde RS Racing. Grip of the leeward rail. Trim af rig og board. 1. Første forsøg med is-surfing. 2. Is-surfing ved juletid . 1. Ice surfing, first attempt. 2. Ice surfing at Christmas. the volume of a board. PWA og valg af grej. er det bedste for os? sail in a simple way. verdener samlet i ét board. A quick and easy job. your fin a new angle. - og om at kikke indad. A fairly easy DIY repair. Et trut for at handle lokalt. wave board for a few quid. På vej mod et jubilæum. into a 2017 iSonic 97.
the tal of a 2016 iSonic. of big race sails (until '06).